← And Just Like That…It’s Done! Shortly after the holidays, I ran across one of the many cold bugs that folks have been passing around for the last month. I bravely powered through it only to run into another one. And another. And another. None of them really knocked me over, though each successive sniffle broke down another layer of defense. Last weekend, after a really lovely date night out with Husband (some good food, a rock opera, and a few drinks), I finally succumbed to a nasty cold. My nose runneth over, to put it mildly, and I resigned myself to spending several pajama days in bed, fortified with cold medication. Now a word about the effects of cold medication on my unique bodily system. That warning on the side of the package telling parents that some children may react to the medication with hyperactivity? That message is for me. My 41 year old body reacts as if I were still 6. Bouncy is an understatement. Zippy may be more appropriate. At least for the first few doses. Knowing that I would have at least a few days of enhanced energy levels, but that I couldn’t go out into the world, I gave myself a new project. I had just finished a cozy sweater and was riding high on that success. I felt ready for a new challenge; one that would capitalize on my hyperactivity and solitary confinement. A puzzle that needed several hours of concentrated effort to decipher. Remember when I told you about my favorite cozy sweater? The one that I’ve had for at least 10 years, that is so worn well loved that the dye is fading from the wear points? The one with the fabulous cables and perfect fit that earn rave reviews each time I wear it? Yep, that one. My family will recognize it as the sweater I wore in every family photo for several successive holidays. It’s a classic. That’s the sweater project I chose to tackle in my medicated state. Most sane people would settle in with a stack of good books and a movie or two. Not me. Maybe it was the fever? I reasoned that I had finally knit enough sweaters of varying construction to tackle the basic shape. I reasoned that I had the knitterly experience to figure out the various stitches that make up the overall pattern – there are four stitch patterns in there, ignoring the bobbles (I abhor bobbles). I reasoned that my personal library contained enough reference material to help me answer any questions that arose (and if not, there’s always the Internet). I reasoned that I would not encounter the perfect storm of focus, time, and solitude again anytime soon. I would spend these hours productively. I don’t know how it happened. Maybe it was the right project at the right time. I’ve been wanting to do this for years, but I was scared of the complexity and my relative lack of experience. Those other designers have been doing this much longer than myself. But somehow my designer brain and my technical brain decided to work together on this project. I drew on the years of architectural and technical design experience working on projects where I didn’t have a clue what I was doing, but was trying it anyway. I won’t say it is easy – it requires real concentration and the right frame of mind – but it sure is fun! I gathered my materials: the original sweater, yarn in the appropriate weight, needles, graph paper, pencil, measuring tape. 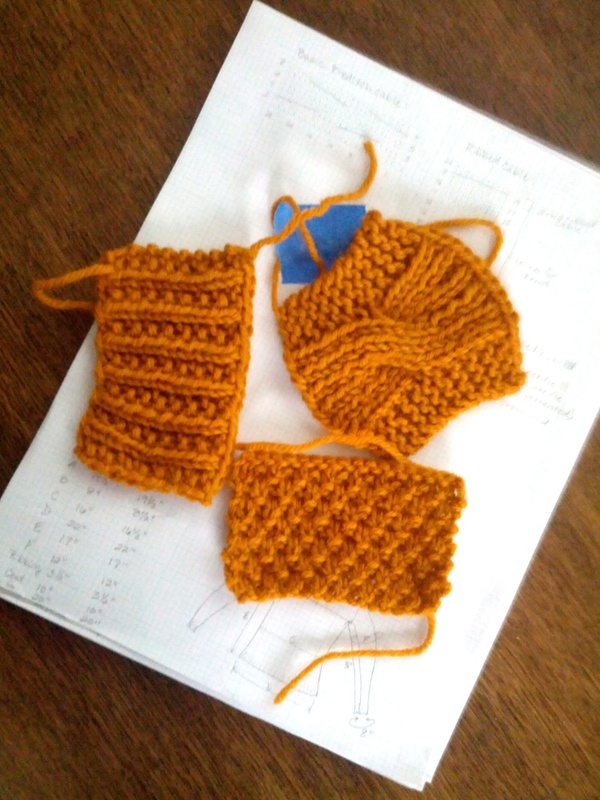 Starting with the easiest stitch pattern to decipher – easy wins are best for building momentum – I sketched out the stitches and knit up a quick swatch. Then I moved on to the next easiest stitch pattern, repeating the effort for each one and working toward the most puzzling. With each “win” I felt more confident. The final puzzle was the intricate looking, but super flexible, ribbed cable. This one is magic. This one required some real thought and a few passes through the swatch before I could confidently sketch out the stitch pattern in chart form. How to maintain the rib pattern during the cable crossing? Once I had that figured out, I danced through the house. I was on a roll! Now I had all of the elements in hand. Now for the real brain work. The next task was to put those elements together – in the correct stitch count, increasing here, decreasing there – so that the finished item would both resemble my beloved original sweater and fit beautifully. Did I stay on task? Or did I succumb to medicine head and the lure of a good nap? Stay tuned to find out! 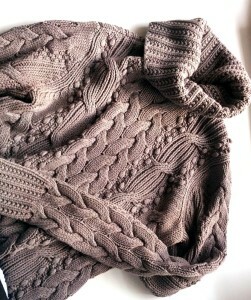 This entry was posted in Knitting and tagged cozy, creativity, design, knitting, sketching, sweater, winter, wool. Bookmark the permalink.